We look at planes in the sky, wondering about from where they took off and where they will land - clean trajectories, pures curvy lines. And even if we can track this intempestive ballet on our phones, we are dreaming they will fly endlessly, and never land. In many aspects, I belong to the second generation, to a time right after a disconnexion. I was born in another continent than my parents. Where they once could feel complete, everything has changed drastically and will never be the same. After building a sanctuary in their minds to continue to be true to themselves, they crossed the mediterranean sea many times and somehow parts of their hearts and souls remain floating somewhere above the water. Where they found safety and hope for a better future, they couldn’t feel complete unless they immersed themselves in their new constantly-changing environment. Their choices defined their identities along with their efforts of openness toward others ways of living and cultures. Their unique, precious and very inspiring perspectives on life are enhanced by theses multiplicity of lenses. Ambient light, iridescent acrylic paint and polyester (1,4 x 3 m). Variable Dimensions. A translucent textile is suspended and takes its autonomy by distancing itself from any wall - it reveals shimmering colors and a «Moiré effect» , an undulating drawing created with the superposition of two textiles trams. The movements, sometimes caused by an airstream or the displacements of bodies, shake this vibration. Only the outline of the painted heavenly body appears steady, possibly one of Mars’ moons. Aluminium, chemical patina and stones. 20 x 40 x 5,5 cm. A chemical reaction on an aluminium plate with a liquid patina. Stones shaped by water, and subject to a human transformation as derisory as possible, complete the composition. They were collected during travels in differents countries and come from a river bed in Switzerland and from the sea along the finnish coast. Brass, chemical patina, magnets and stones. 20 x 40 x 2,5 cm. Brass, chemical patina, magnets and stones. 10 x 25 x 2 cm. Brass, chemical patina, magnets and stones. 10 x 25 x 1 cm. Verdigris is witnessed in many cities all over the world. On statues, facades or domes, verdigris manifests and develops, over a very long time, with air and humidity. Verdigris is a reminder of the passage of time - underlining that everything is subject to change, even the seemingly irrevocable, steady or fixed. In this serie of works, some metal-molecules are activated with a liquid patina, which allows to highly speed up the chemical reactions. Verdigris, therefore, melts with a liquid and fast painting gesture. 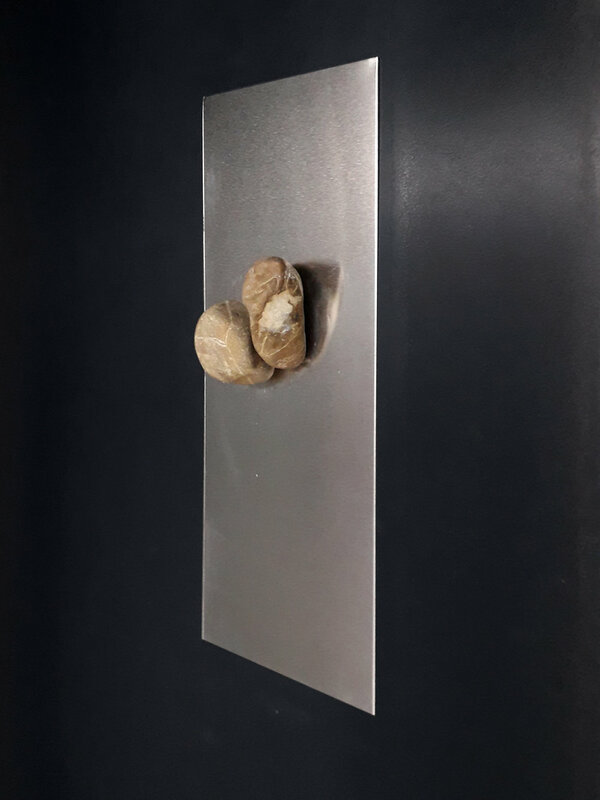 Stones shaped by water and subject to a human transformation as derisory as possible, complete the compositions. They were collected during travels in differents countries and come from a river bed in Switzerland and from the sea along the finnish coast. Aluminium, magnets and stones. 10 x 25 x 2,5 cm. Aluminium, magnets and stones. 10 x 25 x 3,5 cm. Collected from a river bed in Switzerland, theses pairs of little stones were shaped by water over a very long time. Even if they were subject to a human transformation as derisory as possible, they correspond and match almost perfectly together. 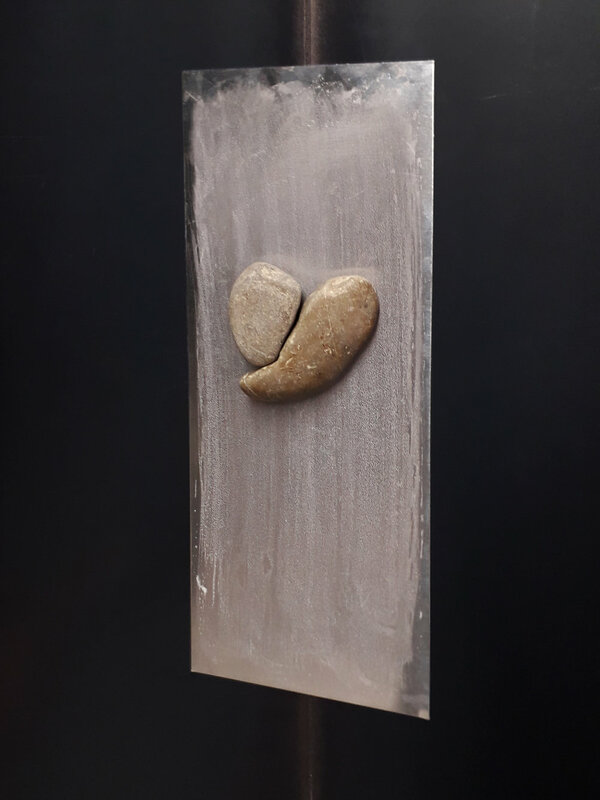 Stones, iridescent paint, polyester foil (55 x 65 cm), mat varnish, ink and miror paper (55 x 65 cm). Variable dimensions. Stones, iridescent paint, polyester foil (105 x 65 cm). Variable dimensions. The first layer is a very simple gesture of fulfillment. A withdrawn gesture as an invitation to contemplate the changes of color according to the surrounding light and the position of the body in space. The second layer is made of partially painted stones shaped by water and subject to a human transformation as derisory as possible. They were collected during travels in differents countries and come from a river bed in Switzerland and from the sea along the finnish coast. Photography, numeric print on glossy paper. 24 x 30 cm. An outdoor facade, a private space and a passing light overlap.